Jones, R.A. (2009). Another record of Bembidion octomaculatum (Goeze) (Carabidae) in West Kent. The Coleopterist 18(2): 79. Carr, R. (2005). Bembidion octomaculatum (Goeze) (Carabidae) in East Kent. The Coleopterist 14(3): 114. Hodge, P.J. (1997). A recent record of Bembidion octomaculatum (Goeze) (Carabidae) from West Kent. The Coleopterist 5(3): 68. Telfer, M.G. & Eversham, B.C. (1994). Bembidion octomaculatum (Goeze) (Carabidae) in Norfolk: a second 20th century British locality. The Coleopterist 3(1): 21. Owen, J.A. (1994). Bembidion octomaculatum (Goeze) (Carabidae) - an overlooked record?. The Coleopterist 3(2): 37. Jones, R.A. (1992). 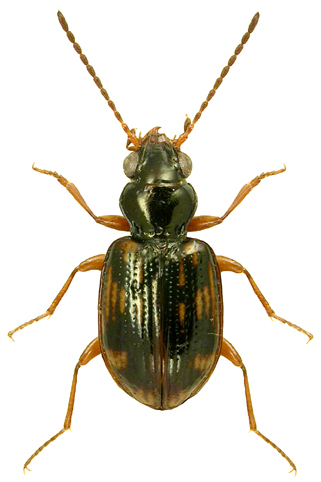 Bembidion octomaculatum (Goeze) (Carabidae) rediscovered in Britain. The Coleopterist 1(3): 2.